Purchase the ebook using Paypal or credit/debit card and you will be sent an automatic email immediately after purchase with download links to the pdf and iBooks file formats. Check your spam folder if it does not arrive after a few minutes. The download links in the email expire after 48 hours so make sure you download straightaway. Creating a free account when you make your purchase is optional. If you do, you can log in later to download the files again, including any updated versions that have been added. This ebook cannot be printed. Welcome to Visit visa refusals: how to challenge decisions. This ebook guide to visit visas is designed to help you if you or a member of your family has been refused a visa for visiting the United Kingdom. 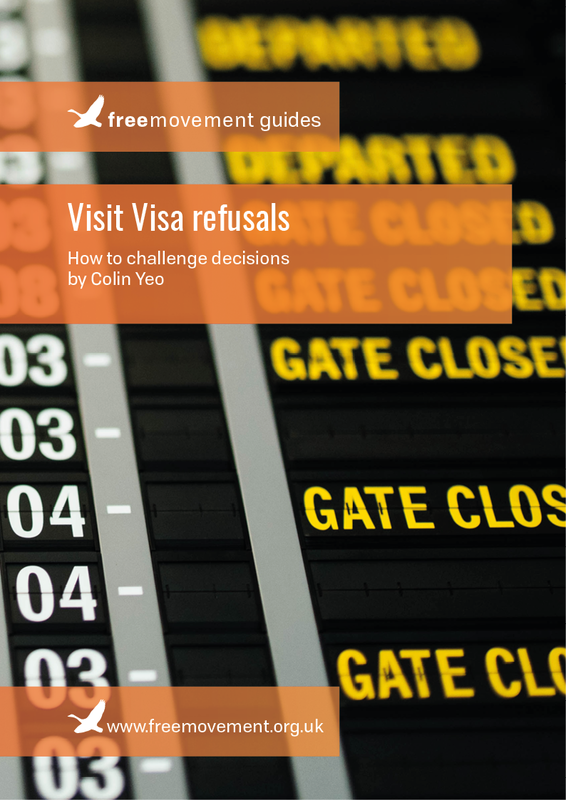 The ebook includes a plain language explanation of the rules on visit visas, hints and tips on the classic reasons for refusal and how to avoid them and a detailed guide to challenging a refusal. The ebook was updated to a second edition in April 2015 to include additional material on the new Appendix V on visit visa applications and on rights of appeal against refusal of a visit visa. If you are trying to navigate the visit rules and want to avoid a refusal or challenge a refusal, this guide is for you. As a public access barrister I can be instructed directly by members of the public who have a legal problem. If you find this guide is not enough, do get in touch with me through the public access team at Garden Court Chambers. Call 020 7993 7600 or visit us at www.gardencourtchambers.co.uk. Download includes access to both a pdf and an epub file for use on a variety of tablets and ereaders. The epub format includes an interactive contents page and will open in Apple iBooks. I bought this eBook, not because I have encountered a refusal, but because I was hoping to avoid encountering one. So that means that some of the book isn’t completely relavent to me and my partner, but the explaination of how to avoid refusal in the first place is perfect for what I needed. I still have a couple of questions but they are outside the scope of this book, and I suspect I will probably need to sigh up to the site properly to get the answers I need. On that note, great site, very informative and a valuble source for those needing any immigration advice. Hightly recomended. If you are like me and think applying for a standard UK visitor visa for yourself or a friend would be easy, think again! The procedure is difficult, time consuming and very privacy invasive. Being refused the visitor visa as a genuine visitor and all this time consuming work is one of the most humiliating experiences I had in my life. It’s like a huge “Lying, fraudulent, dishonest person” stamp on your forehead and worst of all, this refusal goes in a computer database forever and can ruin future travel plans. So my advice to you is : buy Mister Yeo’s book before applying for any UK visa. The information contained in his book is invaluable and will make you avoid experiences like mine. Mister Yeo is an expert in this field and if you should need legal counsel about UK visa matters, I would highly recommend his services. I found it very helpful. Sufficient information to give me a good idea of the difficulties and attitudes of the officials who refuse applications. Has helped me with helping a family whose relative has been refused a visitors visa despite seeming to have provided all the appropriate information and evidence. They are going to approach and MP and your book has helped with the kind of things to emphasise. A great book and starting point. Very good ebook. This subject, if you’re experience it directly, is scary, it’s bewildering, often unfair, and always confusing. This ebook and the accompanying sites, helps. It provides clear information and starting points and approaches for dealing with potentially complex and ongoing problems in need of solutions. I highly recommend this book, and hope it will help many people. 155 of 293 people found this review helpful. I found the e-book very helpful. I am trying to help someone get a Visitor Visa and their application was refused. This book helped me get an insight into the system and the reasons which are given in refusals and some help with the kind of issues to concentrate on when approaching a member of parliament for help.